Dosdpmv.exe APM disk for DOS 5.02+ and Windows 3.1. "Seems to have added a lot more DMQS monitor files too. All dated 10-9-97"
Multiple XGA-2 Adapter Support MXGA, where are you? Found this after a 9577 Strip-A-Thon. The wire comes off pin 5 of U20, then it winds it's way over to pin 178 (I think!) of U2. I might be wrong (again?) but I haven't seen much rework on an XGA-2 adapter. Comments? 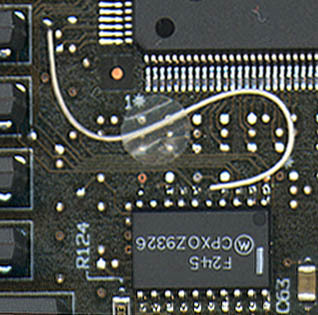 The 74F245 in the picture is an 8-bit bus buffer ... therefore I think they jump-wired a bad connection on the XGA2 board only. I have checked all my XGA-2s and none (so far) has this connection. Haven't tested in depth if there is a connection between the points at all normally. > No, no and no again. There is no such thing as a 2MB XGA-2. I know that's what people keep saying, but I have two folks here in town who will _swear on their mother's grave that they have had one in their physical possession. One person has been known to tell tales, but the other I consider reliable. - late, with the IBM "BlueChip" RAMDAC. Blue RAMDAC is P/N 89G2928, mfg-date 34th week 1994. Interesting looking heat-spreader turned by 45°. >If only the RAMDAC would actually run at its full spec that would be possible. Unfortunately, at least with the XGA-2 in my 'E' (9533), I am forced to run at 1024x768@70Hz (no 75Hz). 1024x768@70 is a 75MHz dot clock, whereas 1024x768@75 is an 85MHz dot clock. I've seen and described that effect earlier (*much* earlier) with a XGA-2 using the "heatsinked" RAMDAC ... but apparently my PS/2e ran quite nice on the Eizo F35 at 1024 x 768 @ 75 Hz. Going above that will cause "speckled" icons and litter the desktop when moving objects or open / close windows. It also seems as if the later "white board" RAMDAC and the last "IBM blue glass" types were an improvement over the earlier versions. Same effect can be seen on Mod. 9556 / 9557: the early RAMDAC has a round "heatsink tower" glued atop - the later ones and all 486SLC3 haven't. The later ones run much more stable. Currently I have a "blue RAMDAC" XGA-2 in my turbo-95A. Run OS/2 Warp at 1024 x 768 / 256 colors and 76 Hz. No negative side-effects. If you try running MS-DOS mode under W95 with an XGA-2 adapter, you will be rewarded with a blank screen. Nothing, yet typing EXIT restarts Win95. Create a DOSSTART.BAT with a single line of "mode co80". Ed. Save it in the \windows directory or a directory on your path. It works on my 9590 with an XGA-2 card. Check out UZ's XGA206.ZIP for real XGA-2 support. For Type 4 complexes, you have the most recent ADFs for the XGA-2 already. For older 90/95s, 55/56/57/70/80 systems you need the current XGA / XGA-2 option disk from IBM ftp and *boot* the machine with it prior to install the card. Run "Update a Mod. 90 / 95 system partition" to make sure you have the lastest ADF, DGS files on the partition. Then install the XGA-2 physically. If you have an 8590 or 9590, all of the connectors WILL NOT fit into the slot. You have a choice of Slot 2 or Slot 4. For more details, go HERE. For the 8595 / 9595 systems, Slot #5 is the one you should use. Next recommended step: if you are running DOS / Win 3.x or Win95 get the DOS / Win 3.x drivers Ver2.12 . Run the Install from DOS and install the DMQS monitor profiles first. This avoids some error messages later on. Trust me. I'm not worried about DOS drivers, but if you are, install the DOS drivers before you leave the Install program. In Win95 you can force the display to use 75Hz refresh at 640 x 480 modes with using the VESA-driver XVGARATE 75 NOWARN in the AUTOEXEC.BAT -..usually the XGA-2 comes out in 60Hz in that mode. Unlike to the XGA-1 the XGA-2 is capable to identify the attached display and set its defaults to corresponding values. For a "better than XGA" monitor select the "14 Inch VESA" with 75Hz refresh in all modes - did that for my EIZO. If you run OS/2 you will have to use "Change Installation" again and select XGA-2 as primary video. After installation of the drivers you will find a second page in the displays properties folder (right arrow at the bottom of the page), where you can select monitor types, resolutions and refresh rates. This utility should be used if an XGA-2 subsystem is being used as the primary VGA source in a system and a Multi-Scan type of display is attached. Most Multi-Scan type of displays respond as an IBM 8514 display when interrogated by the XGA-2 subsystem Power-On Self Test (POST) program. As a result the VGA video will be displayed at the '60Hz' refresh rates shown below (the normal VGA rate for IBM 85xx displays). video rates, this utility may be used to override the default rate. WARNING: If this override is used in an AUTOEXEC.BAT or CONFIG.SYS, then care must be taken to ensure that the parameters specified are suitable for the attached display. Selecting the wrong video rate may result in VGA video not being displayed correctly, or even (in some cases) damage to the display over time. If the display cannot support a chosen rate, the system must be rebooted. nowarn = NOWARN prevents the Y/N WARNING before execution. XGA/XGA-2 use a 32-bit data bus for all system memory and I/O addresses. The VGA subsystem uses either an 8-bit or 16-bit data bus. With a 16-bit data bus, XGA uses a 512KB video display buffer, with a 32 bit data bus it uses a 1MB video display buffer. With a 32-bit data bus, XGA-2 uses a 1MB video display buffer. VGA provides for an 80 character per line text mode. XGA/XGA-2 supports 132 characters per line on any display that has a vertical refresh rate of 46.8 Hz interlaced or 59 Hz non-interlaced. XGA/XGA-2 support 1024x768 by 256 colors. This mode supports real and virtual memory addressing and multiple adapters in one computer. Also known as palette bypass mode. With 1MB of VRAM, the direct color mode provides 640x480 with 64k colors. VGA is limited to 256 colors. DOS AI makes the XGA/XGA-2 8514/A compatible at adapter interface level and above. You can install up to seven XGA-2 adapters in a MCA bus system (limited by slot availability) or six if the XGA-2 is built into the planar. When multiple adapters are used, they can do VGA or 132 column text mode. However, VGA mode uses one set of addresses, and only one adapter can use those addresses at a time. “Therefore, only one display at a time can interact with the computer in the VGA mode or 132-column text mode to change or refresh the image that it displays”. Ed. What? What if all the adapters are in 132 column text mode? NOTE: A company in the UK called “Software 2000” had a multiple XGA-2 driver called (wow!) MXGA. Consists of the display controller, video display buffer, serializer, palette, and the digital-to-analog convertor (DAC). Consists of the PS/2 interface controller, memory and cathode-ray-tube controller, and the video coprocessor. This is the video interface to the microchannel bus. The controller detects the bus width (16 or 32 bit) of the slot and prepares to transfer data at that rate. It also acts as a busmaster that supports the video subsystem (read adapter). This supports all VGA functions. It allows the system microprocessor to access the video display buffer, and it controls the serializer and DAC. Provides hardware drawing functions that can store graphic data in both the video display buffer and system memory. Allows the video subsystem to become a 32-bit busmaster that directly accesses system memory when in the extended graphics mode. Acts like a busmaster to other devices on the system bus, such as another XGA-2 adapter, when in the extended graphics mode. It can perform burst mode data transfers at up to 16.6MB per second. Updates memory independently of the system microprocessor, which can then do other things while the coprocessor is drawing graphics. The buffer uses VRAM to store information that is being displayed. VRAM allows data in the display buffer to be updated while the image on the display is being refreshed. 1MB of VRAM provides faster performance in all video modes because the data path into the video display buffer is 32 bits wide. With 512KB, the data path is only 16 bits wide. The serializer and DAC convert the data in the video display buffer to the imge you see on the screen. The video data is stored in the video display buffer in 1-, 2-, 4-, 8-, or 16-bit units, known as pels. The number of bits per pel is determined by the video mode that the computer is operating in. Each memory location in the buffer holds one pel and corresponds to a specific location on the screen. The binary value of each 1-, 2-, 4-, or 8-bit pel is used as an index into the palette to determine the color that is to be displayed at that location. If the computer is in the direct color mode, each pel is 16 bits, and it does not use the palette to determine the colors. The serializer takes the data from the video display buffer and converts it into a serial bit stream. If the pels are 1, 2, 4, or 8 bits, the binary value of each pel corresponds to one of the 256 memory locations in the palette. Each memory location contains 18 bits, divided into three 6-bit values that represent specific intensities of red, blue, and green. In the direct color mode (palette bypass mode), each 16-bit pel is divided into a 5-bit red intensity value, a 5-bit blue intensity value, and a 6-bit green intensity value, for a total of 65,536 possible colors. The DAC converts the digital color-intensity values to analog values, which are more efficient than digital values for displaying the large number of colors produced by high performance video. The DAC places the analog values onto the display signal lines, and a colored dot is displayed on the screen. Easy, right? This determines where in the I/O address space the video registers exist. Because you can install multiple XGA-2 controllers, the computer assigns a unique I/O address and instance number to each video controller. This determines the area of adapter ROM address space used by the video coprocessor. The video coprocessor is used when the XGA video is in the extended graphics mode. The coprocessor is not used when the XGA video is in the VGA mode. This area of memory (C0000 to DFFFF) is normally used for read-only memory (ROM) on adapters and is commonly used by memory managers for expanded memory or high-RAM support. A conflict might occur if both the memory manager and the video coprocessor are using the same area of memory. Many applications use the 1MB of VRAM to display high resolution, multicolor images. The video function provided by most programs work within 64K blocks, which are paged or swapped in and out of the 1MB VRAM workspace. Other programs, such as OS/2 multimedia extensions, require direct access to the entire 1MB of VRAM to operate. (OS/2 ver 2). What about the 1MB Aperture in Setup? Problem- " The card does not fit any of the slots in my 8590. Oh well, better luck next time." Nope. The correct statement should have been "It does not fit *with all parts* of the connector in the slot" - and this is totally correct. Explanation: the XGA2 offeres a BVE base video extension for those machines that *do not have* a planar video system (like Mod. 77 Bermuda, Server 85 and all 95). The Mod. 90 has no BVE-slot - only one AVE (auxiliary video extension) which is intended for 8514A-style cards that are controlled over the Base Video and / or capable to use the Base Video for Low-Res / Text modes and / or use a video-grabber on VGA. If you get a message Error: Can not find file XGARING0.SYS upon bootup of OS/2, you need to totally reinstall OS/2. 024318XX -- With the new revision of the XGA-2 card (without a heat-sink on the processor chip), you may experience a 024318xx error during the general function test of the XGA advanced diagnostics. This is NOT a hardware failure, as indicated by the callout. There is an incompatibility between the diagnostic program and the microcode on the new processor chip on the XGA-2 card. The solution is to download the new XGA-2 Option Diskette from the BBS (XGA2ADP.EXE). This contains the new version of the diagnostic for the XGA-2 card. After updating IML, insure that you then backup the IML. If the error shows up during post, or if there are problems during the operation of the system, replace the XGA-2 card first. Then if the problems persist, do the above procedure. 024374XX-- Copy an option has not successfully completed. Copy XGA-2 Display Adapter/A option diskette to the backup copy of the system programs/Reference Diskette; then run auto-configuration. The XGA-2 Display Adapter/A features an 8-bit digital-to-analog converters (DACs), versus the 6-bit DACs used by XGA Display Adapter. With 8-bit DACs, the XGA-2 Display Adapter/A now supports a palette of 16.7 million possible color combinations of which 256 can be displayed at any one time. (the XGA Display Adapter allows 256 of a possible 262,144 colors.) Similarly, the XGA-2 Display Adapter/A provides 256 possible shades of grey, compared with XGA Display Adapter's 64 shades. AdapterId 8FDA "XGA-2 Display Adapter/A"
I/O (Input/Output) address range for the display ontroller registers. This field also affects the location of the video coprocessor registers. Each adapter you install must have a unique address range. Normally, the address range does not need to be changed. You must fix conflicts before you use the adapter. <"Instance 6: 2160h - 216Fh">, 1: 2110h - 211Fh, 2: 2120h - 212Fh, 3: 2130h - 213Fh, 4: 2140h - 214Fh, 5: 2150h - 215Fh, 7: 2170h - 217Fh, 0: 2100h - 210Fh"
1 MB aperture from the PC into the video memory. If the aperture has been disabled, it is because there wasn't enough available memory address space for system memory and the aperture. If the aperture must be re-enabled, use the 'Change Configuration' window to select a choice. If this method is not successful, then remove the device that is competing for memory such as a system Micro Channel adapter or system memory. Removal of system memory may degrade the system performance. If the aperture has been allocated an address range and it results in a reduction of usable system memory (with Micro Channel memory adapter) then the aperture can be disabled. You must fix conflicts before you use the adapter. Selects the Bus Arbitration Fairness. When Bus Arbitration Fairness is set it controls whether the adapter will release control of the bus when it has been using it exclusively. Normally, the field should be set to <On>. Address of the 8K block of memory that is assigned to the adapter. Only one XGA or XGA-2 Display Adapter will have the ROM assigned, and any other XGA or XGA-2 Adapter installed will share that address range. You must fix conflicts before you use the adapter.